DG Nteranya Sanginga (front row, 2nd from left) with other delegates. 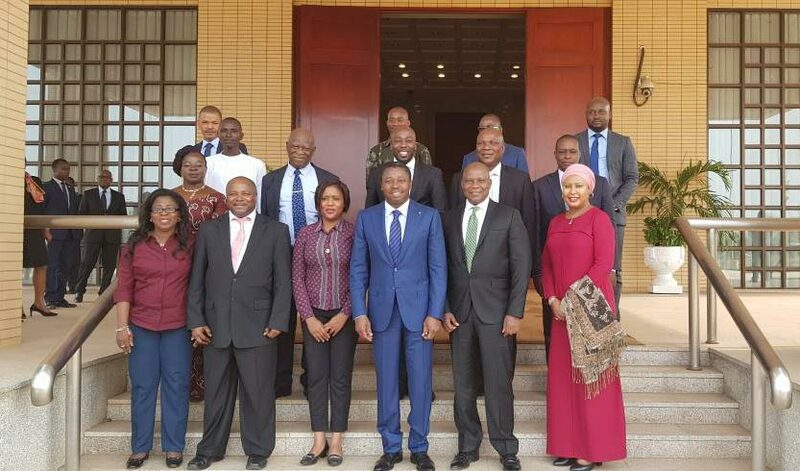 The two principals of the joint delegation (IITA and NIRSAL) and the AfDB Country Manager met with the President of Togo on day 2 of the mission with the Chief of Staff and the Minister of Special Projects to the President. Sanginga summarized the outcome of the meeting with the large group and briefed the President about the opportunity or potential support from the International Fund for Agricultural Development (IFAD), whose Togo portfolio is about $15 million. The President agreed to contact the IFAD President who incidentally had served on his cabinet as Premier Minister in the recent past. The President also indicated that he will meet and brief the AfDB President about this mission when they meet during the AU summit in Addis. The delegation met in plenary on Day 1 with all the Togolese counterparts. The Minister of Agriculture described the challenges that Togo was facing in agriculture and particularly with the cassava value chain. The IITA DG presented on IITA and described how it is helping other African countries such as Liberia and Sierra Leone which faced similar challenges. He also explained about the IITA Youth Agripreneur model that is focused on bringing African youth to become active players and build careers in agribusiness. The NIRSAL CEO presented its model of enabling access to finance throughout the agricultural value chain. On day 2, the meeting broke into two separate groups, one to discuss in detail potential technical interventions, and the other to address financial interventions to support the development of agriculture in Togo, particularly the cassava value chain. A plenary meeting was then convened to integrate the outcomes of the breakaway discussions and agree on a roadmap for action. This plenary meeting was further attended by commercial bank directors, directors of insurance companies, and an administrator of the insurance sector regulatory commission, the head of the Togo federation of agricultural producers, and the head of the food processors association, who were asked to provide their comments and opinions on the proposed actions. Compile existing data on cassava in Togo, particularly the status of market supply and demand, challenges and opportunities of the subsector, and to set development targets. This work could be led by IITA and the Institut Togolaise de Recherche Agronomique (ITRA). The outcome would be a plan of action for the development of the cassava subsector to increase food security in Togo, increase employment and wealth creation opportunities, particularly for women and youth, and in the long run contribute to GoT’s import substitution strategy and supply raw materials for agro-based industries. The GoT to coordinate all efforts for developing the cassava subsector by establishing a Special Initiative on Cassava, preferably coordinated at the highest level of government with the President of Togo as its champion. 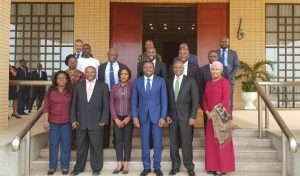 The GoT and the AfDB Country Office to seek resources in ongoing projects that could be reoriented towards the take-off of a cassava development initiative, especially the formulation of the action plan. In the absence of such resources, the GoT could approach other donors. NIRSAL to continue consultations with relevant institutions of the GoT to propose the setting up of a program or institution that could play the same role that NIRSAL has played in Nigeria, or the Ghana Incentive-Based Risk-Sharing System for Agricultural Lending (GIRSAL) in Ghana. The GoT to consider establishing a legal framework with clear indices to be used by insurers and bankers to facilitate the provision of agricultural financing and insurance. IITA to address the challenge of institutional capacity building very early in the implementation of a cassava development program. The President of Togo to brief the AfDB President about the outcome and the way forward to effectively start this initiative as quickly as possible. The joint mission noted that the political will for transforming agriculture and creating wealth and employment opportunities for women and youth was very high in Togo. Mobilizing at short notice government agencies, the private sector (particularly commercial banks), and producer organizations, together with the relatively small size of the country, and the strong political will to produce results are indications that a program to transform agriculture with technologies to boost productivity and remove constraints, and with facilitated access to agricultural finance would have a high probability for success. There are therefore excellent opportunities for the Technologies for African Agricultural Transformation (TAAT), RSF, Affirmative Finance Action for Women in Africa (AFAWA), and Empowering Novel Agri-Business-Led Employment (ENABLE) Youth flagship programs in Togo. The presence of Grands Moulins du Togo and Brasseries du Togo at the meeting is an indication that there is interest in cassava as an industrial raw material for bakery products and for use in brewing beer. Considering that there is already surplus production of cassava in Togo, establishing a Special Cassava Processing Zone (SCPZ) in the southern part of Togo could be a possibility in the future. With the relative abundance of infrastructure (energy, port, airport, West Africa highway, ICT) in the South, a cassava-based ICT could even be promoted as a completely private venture.